An interactive video installation whose lack of coherency is influenced by the number and proximity of audience members who are contemplating meaning. For the past few years, I’ve felt lost… groping about in the darkness for some kind of meta-narrative or greater sense of meaning. I sometimes feel like I’ve reached the end of what I can understand and accept in a techno-rational sense. In desperation, I’m reaching out to other ways of knowing that have been repressed by my determination to frame everything in a Modern empiricist paradigm. So… I’m consulting the spirits of the dead, memories of an imaginary past… anything that I could hope to hold on to. I want to share this experience with Others. I want Others to share in my groping about in the darkness, confused, and grasping for meaning that is just beyond my sensibilities to discern. 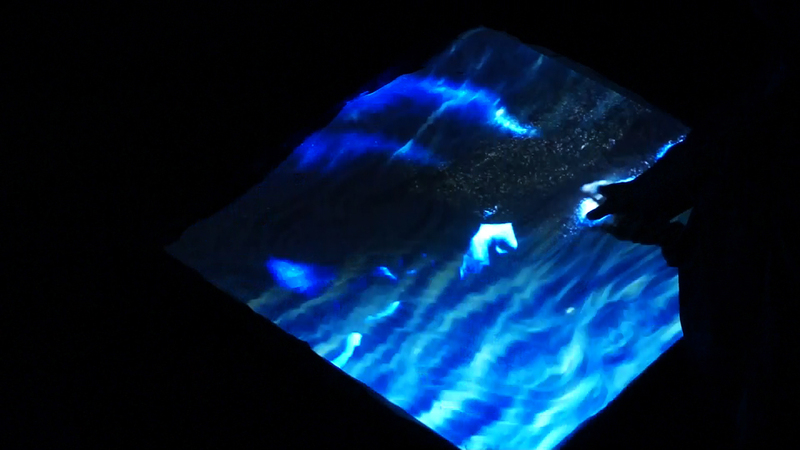 A dark room is illuminated by the reflected light from a video montage grasping, scanning, and writing from the perspective of a single hand projected into a table filled with white sand. Audience members are drawn to the table to view the montage and play in the sandbox, their hands unconsciously mimicking the gestures of the hand in the video. The position and movements of the audience members are tracked by a motion sensing computer vision device connected to a computer which composes and manipulates the montage sequence in real time. The closer audience members are to Ken, the more the various montages presented begin to overlap and distort. At a critical mass of proximity and number of audience members, the montage collapses and the space as seen by Ken itself becomes part of the image briefly before resetting the entire process. Ken makes use of the Microsoft Kinect's 3D motion tracking capabilities combined with Java-based video sequencing software in Processing. © 2019 Vin Hill. All rights reserved.